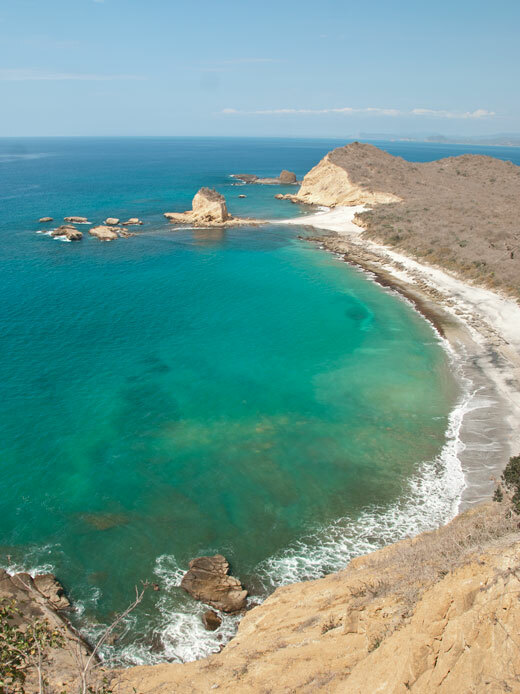 This morning we four Travelers packed up the truck and headed north from Salinas along the Ruta del Sol (Sun's Route), following the coast and skirting the ocean, until turning east back into the interior and up into the mountains. This was a long day of driving through ever shifting landscapes, each mile revealing new sights, unexpected marvels, and the occasional heart stopping road block. But more on that later. First I must relate that we began the morning being confronted by a real force of nature: the distraught niece of Traveler Nine. She woke up to find her Little Mermaid dummie missing. She'd been told two evil cats had stolen it. We hereby apologize to all feline denizens of this world for this lie. We have the photos proving Traveler Ten perpetrated the crime, consigning the hapless mermaid to the conflagration as New Year's tradition demanded. And thus by subterfuge we escaped first breakfast unscathed. Somewhere between Salinas and Punta Blanca we stopped on the beach for second breakfast. 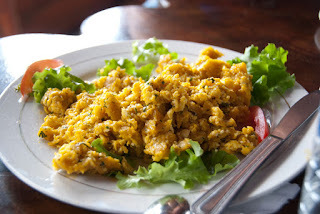 Tostones (plantains with cheese), eggs with plantains, and ceviche were all on the menu. All while we stared into the impossible blue of the Pacific Ocean. 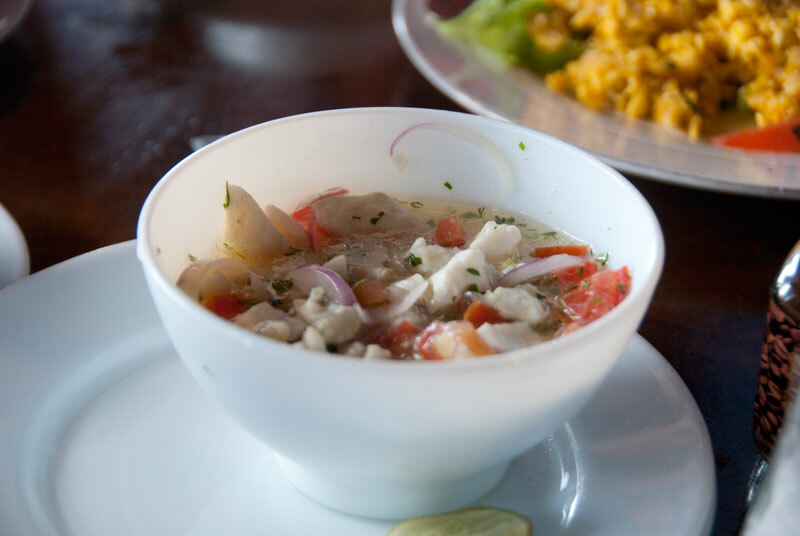 The Ruta del Sol takes you along beach after beach and then through village after village, including Montañita, a surfer's paradise and a pretty cool market town. We kept traveling north, now into dry hills topped by candelabra cacti. We entered Machalilla National Park. This National Park was set up to preserve the coastal wetlands characteristic of the this area that have been threatened continually by deforestation, the expansion of shrimp farm production, and other industries. 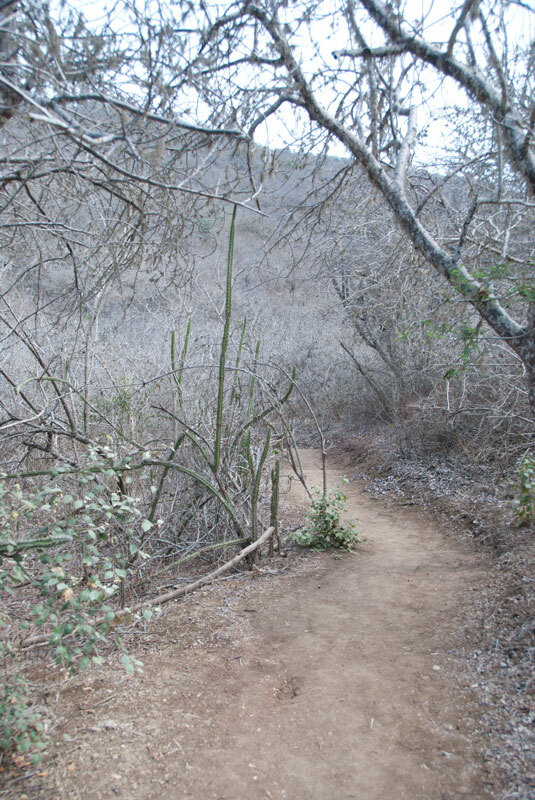 We headed down the dusty track leading to Los Frailes beach. 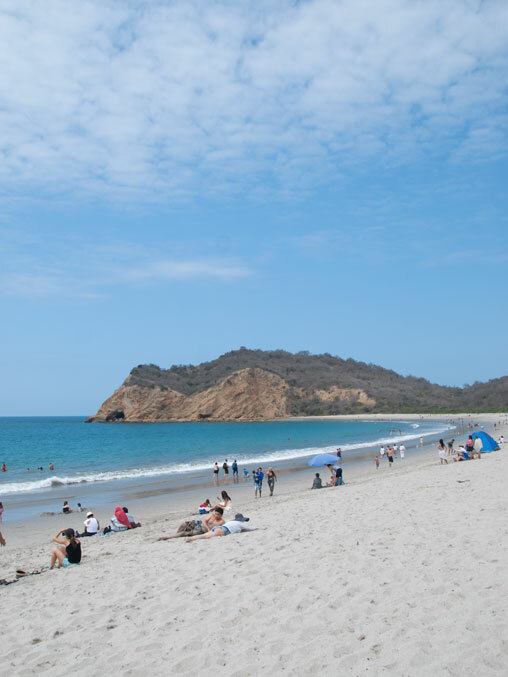 This a beautiful beach, not very crowded, has hiking trails that take you up high hills, into sea caves, and farther along the coast to other incredibly beautiful beaches. 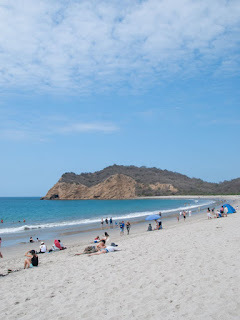 Los Frailes Beach, Machalilla National Park. Sea caves can bee seen on left side of the cliffs in the background. Traveler Nine went swimming while Travelers Ten and Thirteen and I hiked up to the top of the hill above the sea caves. 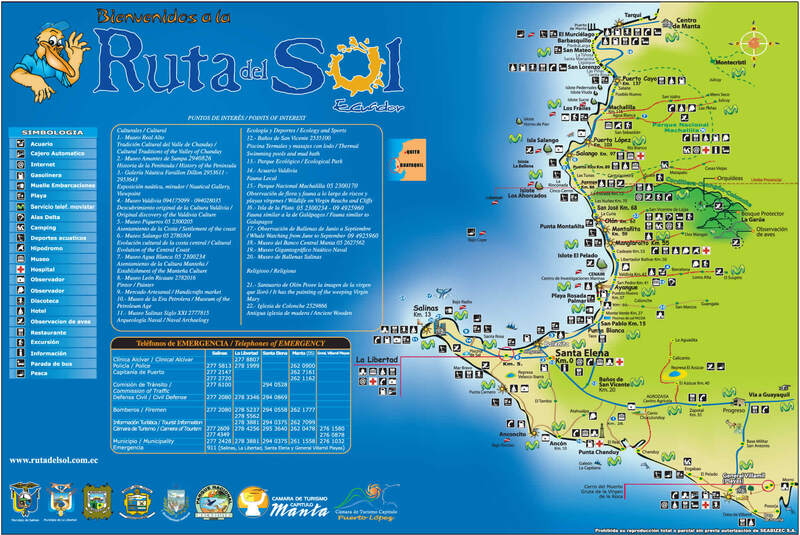 Here you can see the surrounding coastal islands as well as miles down the incredible coast. As we hiked the dusty trail up the hill, lizards scurried away from us and gnatcatchers watched us from their perches in gray dry season trees. This grayness was incredible. 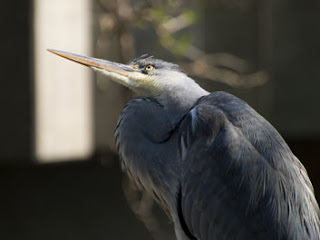 Like the Galapagos, it seemed every creature here was adapted perfectly to fit into this dry world, magnificently matching its surroundings and so amazingly contrasted against the turquoise waters surrounding us. 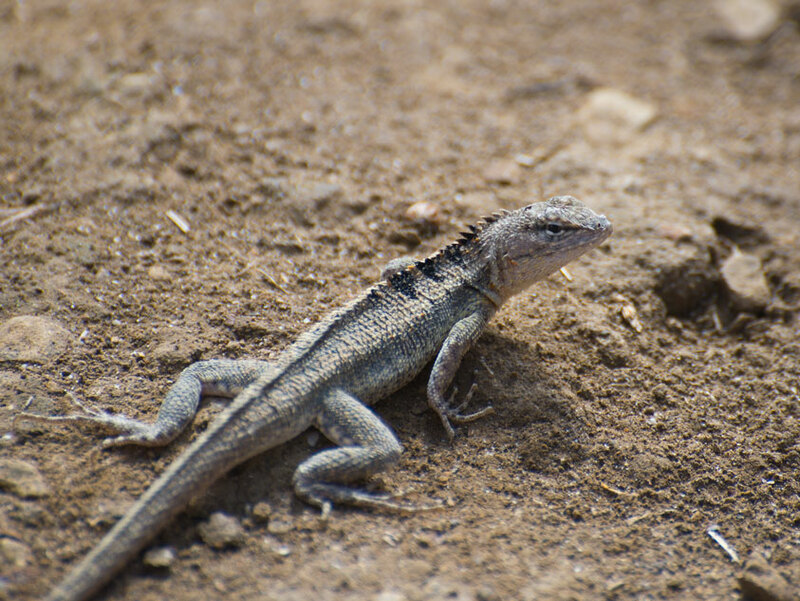 Lizard, Machalilla National Park. 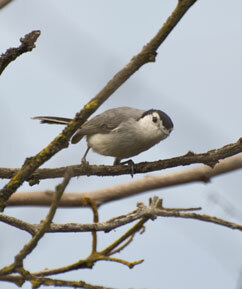 If you know the species let me know. 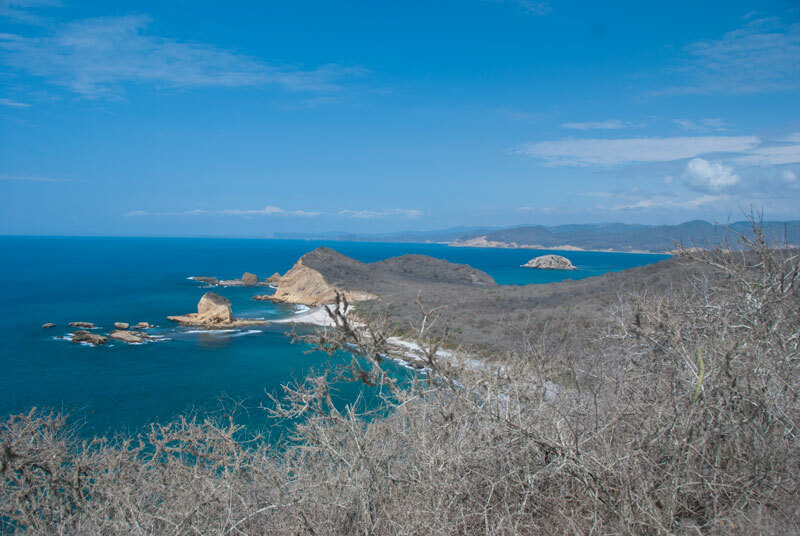 Dry season gray against turquoise and blue. 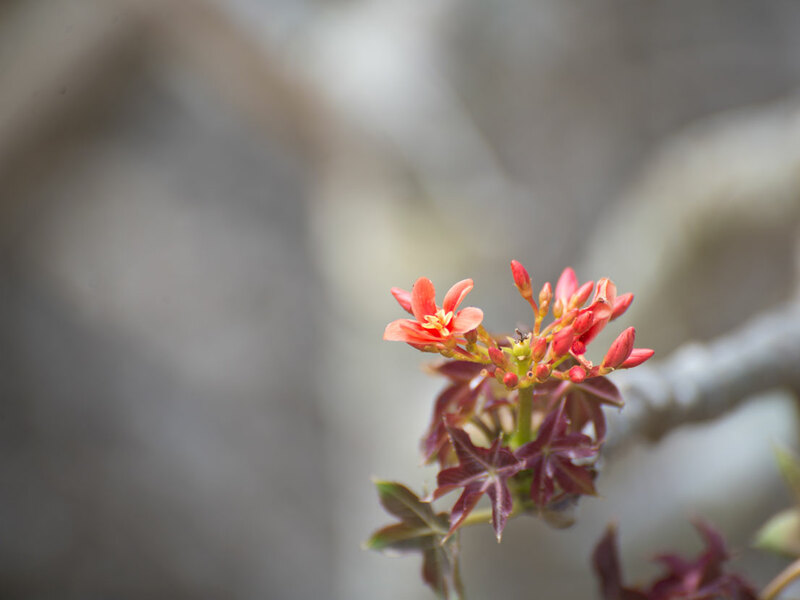 There are always flowers, even in the dry season. After this much needed break from driving we got back in the truck, this time having picked up a temporary passenger. We drove a nice Scandanavian hitchhiker to the main road, where she was replaced by a middle aged Canadian couple we dropped off in Porto Cayo. 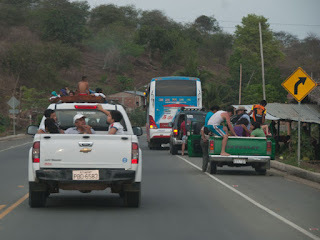 Here we turned east and headed toward Portoviejo. 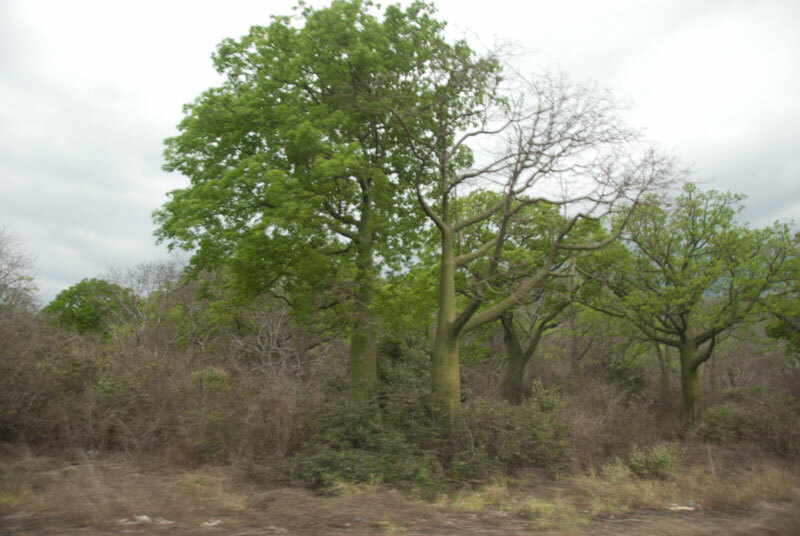 As we drove toward Portoviejo the landscape changed again and Ceiba trees took over the landscape like water storing Ents. These trees stood out bright green from trunk to leaf against the grays and browns of the rest of the landscape. We began the slow climb up into the mountains through magnificent high, now green, river flood plains studded with the blinding white forms of egrets surrounded by Black-necked Stilts and the occasional Andean Coot. 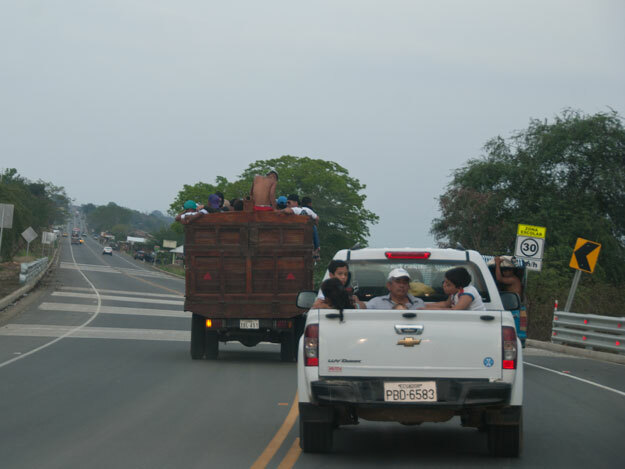 As we approached Chone we passed, and were passed by, many vehicles packed to bursting with people heading into town for the evening. 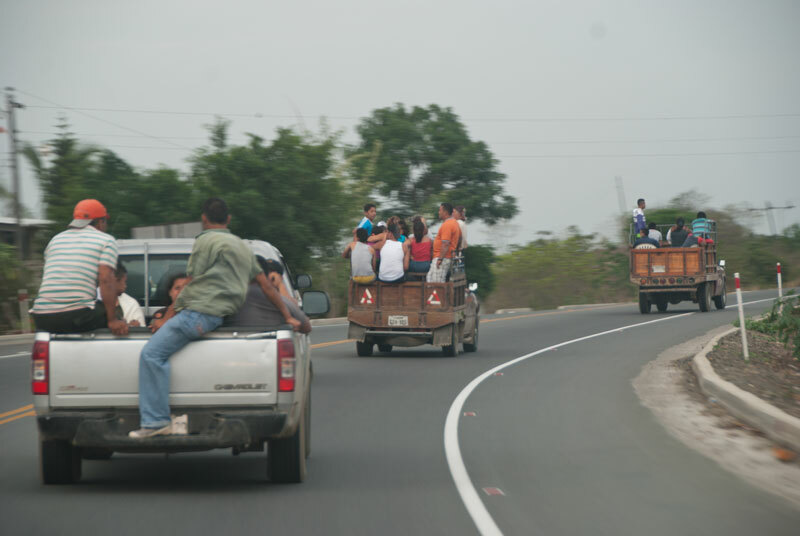 We saw entire families on one motorcycle. Even one with their dog. We passed by all manner of dwelling and farms and businesses. 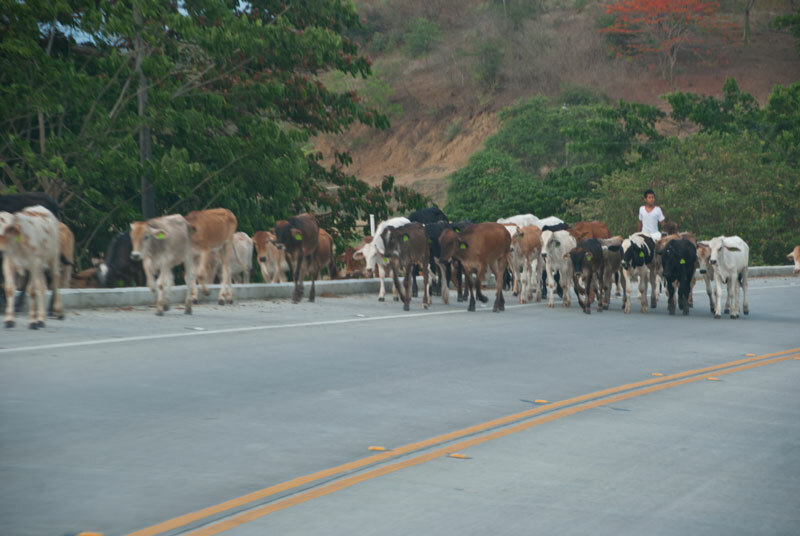 We passed by extreme poverty and enormous wealth, dry hills and lush fields, stray dogs, dead donkeys, herds of cattle, and swirling vultures standing sentry duty. 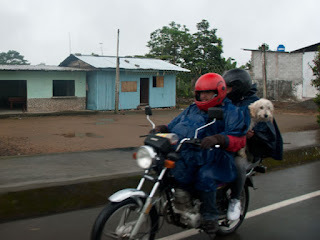 We drove through Ecuador as it is, always amazing, always surprising. Going home or into town. Every truck is public transportation. Going home or into town. 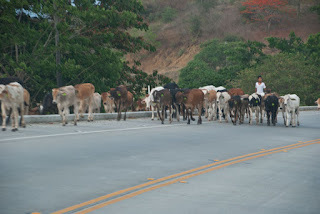 Even the cattle were on the move and using the road to get home. Apparently, dogs don't have to wear helmets. As we passed through Chone and began weaving our way into the foothills of the Andes we passed through village after village. One stood out to beyond any. As we drove slowly through the gloaming, clouds of swallows flitted through the air and clung in their thousands to electrical lines overhead. Then it got dark. Then it started raining. 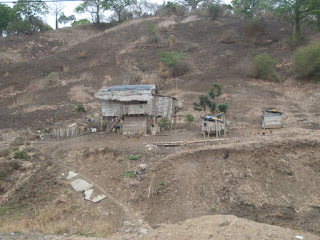 The road got really steep and winding. We winded our way higher and higher into the mountains. Traveler Thirteen had driven most of the day with Ten navigating. Ten took over driving and I navigated. 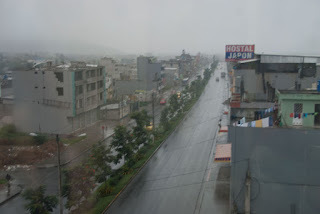 Road conditions became unpredictable. Really unpredictable. 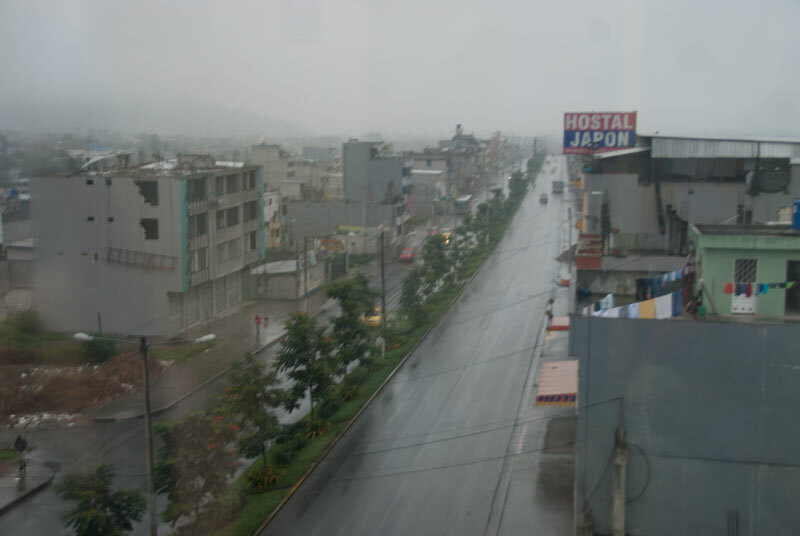 If driving in Guayaquil was like driving during a zombie apocalypse then driving in the Andes in the dark and pouring rain is like playing a video game except if you hit something you die. I spent the next hour pointing out unmarked random piles of dirt the size of houses left in the middle of the road by work crews, downed trees, and places where half the road had washed away. I can't swear it but I think Traveler Ten crawled under the seat in the back out of fear. I wanted to hide too but unfortunately my job was helping Traveler Ten swerve before hitting anything or driving us off a cliff. Ten managed admirably. He even said it was fun. I was just glad we got through it without one of us having cardiac arrest. 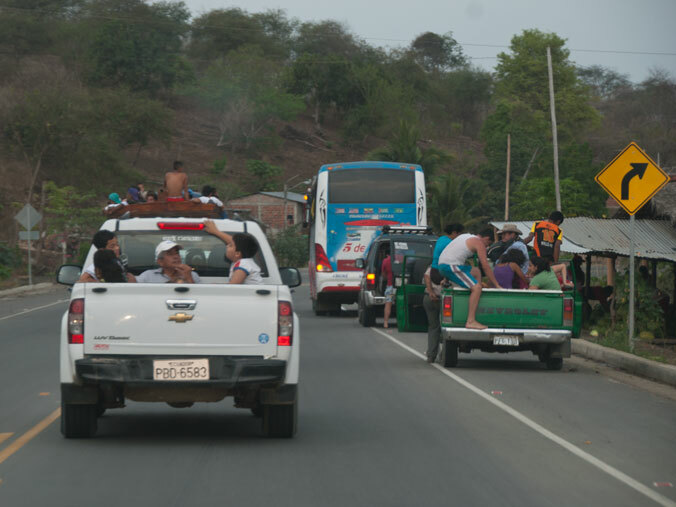 I don't think there were four happier people as we drove into the city of Santo Domingo de los Colorados where we had planned to spend the night. We found a perfectly nice hotel for about $15 a night each and then had dinner for about $20 for all four of us.